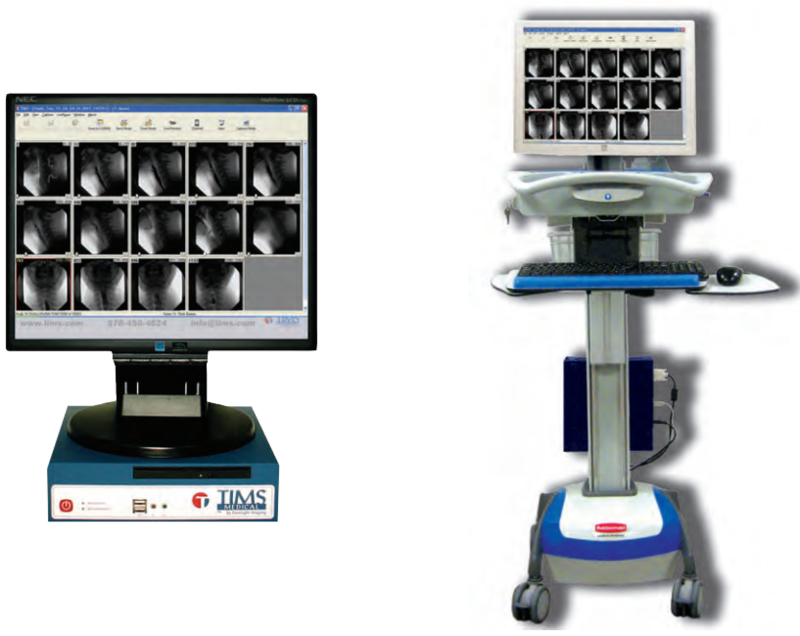 Unlike other DICOM converter boxes, TIMS can acquire from any modality that has a video signal or has a monitor. TIMS can capture from any modality because of the specialized, high technology video capture boards inside the system. Foresight Imaging has been supplying these specialized capture boards to major medical vendors such as GE, Siemens, Kodak, HeartLab, Witt Biomedical, and more for nearly 20 years. This experience allows TIMS to capture any video signal. Other solutions are limited to only standard video signals or have to publish limited compatibility lists. TIMS can calibrate to any video signal and does not have to publish a “list”. Standard TIMS Systems do not include mobile carts. However, for those customers who have a need for TIMS mobility, we carry the Rubbermaid carts from Rubbermaid Medical. Note that having TIMS on a mobile cart is particularly useful when customers desire to place TIMS in the procedure room for applications such as speech pathology and endoscopy.